Application results in a hard, impact and abrasion resistant protective barrier coat that minimizes fiberglass blistering and corrosion. In addition, the hard protective coating flexes with hull movements to bridge and seal hairline cracks. Use Gluvit on aluminum fishing boats to repair leaky aluminum seams and rivets. The cure rate has a long working time that allows penetration into cracks to seal and strengthen. Gluvit fills minor chips and pinholes, and is easily painted with most bottom or topside coatings and paints. Can be used on boats, surfboards, snow boards, etc. A few strokes of Gluvit can renew deteriorated wood. It penetrates and strengthens decking, molding, and stringers. It forms an excellent impact- and abrasion-resistant barrier coat that minimizes fiberglass blistering and corrosion. 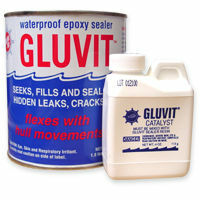 Gluvit seals leaky aluminum seams, rivets, and leaks around decks or cabins. Leaky seams in aluminum hulls can be difficult to seal. Gluvit is an excellent leak sealer and barrier coat for all types of surfaces. This waterproof epoxy flexes with hull or deck movements to resist the checking or cracking associated with typical epoxy systems. Remove all contaminants from repair area with solvent or a strong detergent cleaner. For maximum adhesion, sand the area with 80-100 grit sandpaper, then wipe with dry, clean, rags. Apply a coat of Gluvit with a roller or brush or at 6-8 mils, and tip lightly with a foam brush to smooth the surface, if desired. The finely ground fillers in Gluvit offer superior abrasion resistance. For exceptional corrosion resistance, especially in salt water, Gluvit can be applied to rivets or an entire hull. This epoxy has a working time of about 60 minutes at 72°F to provide ample time to complete bigger projects. Dry rot is a common problem on boats with wood cabins. Gluvit can help to restore damaged wood and seal it against further deterioration. Gluvit has a long open time that allows it to penetrate deep into porous or rotted wood. Drill small holes in the damaged area and fill with Gluvit. It will be absorbed by the wood, and its hard protective coating will seal against further attack by vermin or weathering. Gluvit's protective waterproof coating strengthens stringers, decking and molding, and it flexes with hull movements to maintain effective bridging. Remove contaminants such as grease, oil, and dirt with lacquer thinner or strong detergent. If cleaning an aluminum surface, use an Aluminum Prep Wash to help scarify the surface. For maximum adhesion, sand to a bare surface with 80-100 grit sandpaper. Remove all grit and dust after sanding with another rinse of solvent. Fill deep holes (more than 1/8" in depth) with Marine-Tex Epoxy Putty before applying Gluvit. Pre-proportion sufficient resin and hardener in the correct ratio to cover the areas to be sealed and/or repaired. Gluvit can be broken up into separate batches if desired. Mixing ratio by volume for batches is 5 parts resin to 1 part hardener. If you will be using the entire kit at once, add the entire contents of the hardener into the resin and thoroughly mix contents for 3-4 minutes to insure complete mixing. Be sure you can use the entire kit within the pot life or working time period. Apply Gluvit with a brush or roller at 6-8 mils film thickness. Lightly drag a foam brush in long even strokes over the freshly applied coating to smooth the surface. After the first coat cures for 12 hours at 72°F, a second coat can be applied for optimum performance. Gluvit hardens overnight. Allow 48 hours at 72°F for maximum strength. Working time and cure will be longer at lower temperatures, and shorter at higher temperatures. Note: If the ambient temperature is below 50°F, pre-condition Gluvit and the work area to at least 55°F. Gluvit offers an open time of about 60 minutes at 72°F to provide adequate working time for larger jobs, such as an entire deck or hull. Gluvit cures in 24-30 hours at 72°F. Apply heat to speed cure if necessary or if the temperature will be below 55°F. Gluvit may be applied over mildly damp (not wet) surfaces. Do not apply Gluvit when rain is pending. In the uncured state, Gluvit will absorb rain water, turn milky white, and take longer to cure—but it will harden in time. To overcoat Gluvit after cure, wash the surface with warm soapy water or a dilute vinegar solution and a fine abrasive pad, or wet sand, then dry with clean towels or cloth. Frost-sand surface with 80-100 grit sandpaper to remove any gloss. Gluvit can be overcoated with any marine paint or other coating compatible with epoxies. Polyester resins, such as gelcoat, do not adhere well to epoxy material. Note: All Gluvit containers are packaged by weight. They are slack-filled (not filled to the top), which leaves sufficient room for a power mixer to blend the resin and hardener thoroughly.